Newly-discovered star-forming regions are concentrated at the end of the Milky Way's central bar and in the spiral arms. MIAMI? A large number of star-forming areas in our Milky Way galaxy, previouslyunknown to astronomers, have been discovered. Thesenewfound regions are providing astronomers with important information about thegalaxy's structure and are yielding new clues about the process of galaxyevolution. Thenew star-forming regions were found to be concentrated at the end of thegalaxy's central bar and in its spiral arms. A separate study also located anabundance of enormous hydrogen gas clouds in portions of the galaxy above thecentral bar's junction with a spiral arm ? a finding that was unexpected, said FelixJ. Lockman of the National Radio Astronomy Observatory (NRAO), a member of theteam that made the discovery. TheMilkyWay's central bar structure cuts across the heart of the galaxy, where a supermassiveblack hole resides. It is a region packed with more stars than in thegalaxy's outskirts. Thefindings were presented here today at the 216th meeting of the AmericanAstronomical Society. Thenewfound star-forming regions, called H II regions, are areas in which hydrogenatoms are ionized, or stripped of their electrons, by the intense radiation ofmassive, young stars. Theseso-called "OB" stars are much more massive than the sun, and are veryluminous and bright, said Thomas Bania of Boston University, a member of theteam that found the H II regions. The radiation from these hot, bright stars issufficient to ionize the surrounding gas and produce an H II region that actsas a signpost for star formation. "Wecan clearly relate the locations of these star-forming sites to the overallstructure of the galaxy," Bania said. "Further studies will allow usto better understand the process of star formation and to compare the chemicalcomposition of such sites at widely different distances from the galaxy'scenter." Theresearchers used infrared and radio telescopes to find these regions, which arehidden from detection in the visible light range by the Milky Way's gas anddust. The astronomers were able to see all the way across the galactic disk,allowing them to detect a number of new sites. "Wefound our targets by using the results of infrared surveys done with NASA'sSpitzer Space Telescope and of surveys done with the National Science Foundation's(NSF) Very Large Array radio telescope," said Loren Anderson of theAstrophysical Laboratory of Marseille in France. "Objects that appearbright in both the Spitzer and VLA images we studied are good candidates for HII regions." Theastronomers then used the NSF's Robert C. Byrd Green Bank Telescope in West Virginia, an extremely sensitive radio telescope, to detect characteristic radiofrequencies emitted by electrons as they recombined with protons to formhydrogen molecules. Evidencefor the process of recombination confirmed that the regions studied containedionized hydrogen and were indeed H II regions. "Wehave doubled the census of known star-forming regions," Bania said. "Combined with the previously-known sample of H II regions, we can seelocations of star formations throughout the Milky Way galaxy." These25 extremely distant star-forming regions were detected in an area where onlytwo were previously known. 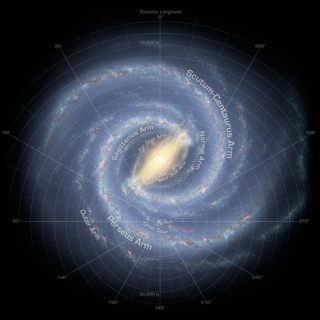 These regions that are beyond the solar circle couldbe an important key to unlocking mysteries of the Milky Way's chemical makeup,said Bania. "Findingthe ones beyond the solar orbit is important, because studying them willprovide important information about the chemical evolution of the galaxy,"he explained. "There is evidence that the abundance of heavy elementschanges with increasing distance from the galactic center. We now have manymore objects to study and improve our understanding of this effect." Ina separate study, the discovery of enormous hydrogen clouds in portions of theMilky Way will also help astronomers better understand the process of galacticevolution. "Theproperties of these clouds show clearly that they originated as part of theMilky Way's disk, and are a major component of our galaxy," Lockman said. "Understanding these clouds is important in understanding how materialmoves between the galaxy's disk and its halo, a critical process in the evolutionof galaxies." Thedetection of these clouds came as a surprise to the researchers, because of theirimmense size, mass and density. Themassive clouds consist of neutral hydrogen gas, with an average mass equal tothat of approximately 700 suns. Their sizes vary greatly, but most are about200 light-years across. "They'realso quite far above the Milky Way's disk," Lockman said. "Andthey're dense. These things should be falling like rocks. They're not likeclouds on Earth. These things have densities hundreds or thousands of timesmore than their surroundings. How do they fit into the Milky Way'sevolution?" Theastronomers studied 650 of these hydrogen clouds in two distinct andwidely-separated regions of the galaxy. The clouds are between 400 and 15,000light-years above or below the disk-like plane of the galaxy. TheMilky Way's disk contains most of the galaxy's stars and gas, and is surroundedby a "halo" of gas more distant than the clouds that the astronomersstudied. "Theseclouds were first detected with the National Science Foundation's Robert C.Byrd Green Bank Telescope, and are quite puzzling," Lockman said. "They are in a transitional area between the disk and the halo, and theirorigin has been uncertain." Theresearch team also used data from the Galactic All-Sky Survey, made with theParkes radio telescope located in Australia. Bycomparing the observations of the two regions, the astronomers saw that oneregion contained three times as many hydrogen clouds as the other. Furthermore,that region's clouds are, on average, twice as far above the galaxy's plane. Thisdramatic difference, they believe, is because the region with more clouds liesnear the tip of the galaxy's central bar, where the bar merges with a majorspiral arm. This is an area of intense star formation and contains many youngstars whose strong winds can propel gas away from the region. Themost massive stars will also explode as supernovas, blasting material outward.In the other region of clouds studied, star formation activity was found to bemuch more sparse. "Somehowthe clouds in the halo reflect the underlying star-forming activitybelow," Lockman said. Theresearchers believe that the clouds are generated as a byproduct of theenormous amount of energy emitted into the galaxy's atmosphere ? called the interstellarmedium ? from the explosions of supernovas. Thethick bubbles of energy created by the explosions then break up into the cloudsthat were observed by the researchers. Thelifetimes of these clouds and how they are held together remain unknown, saidLockman, but understanding their origin could provide clues about the MilkyWay's atmosphere as a whole. ?